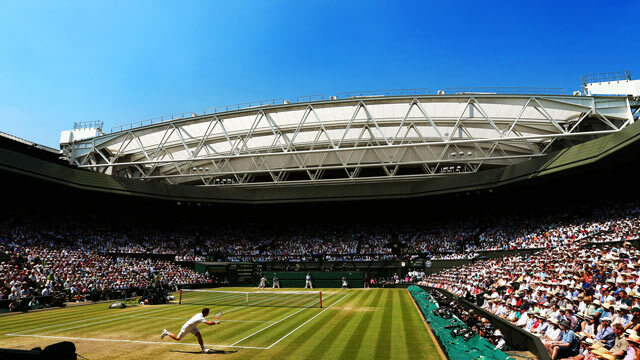 Wimbledon – Follow the Tennis match between Roger Federer and Kevin Anderson live with Eurosport. The match starts at 14:00 on 11 July 2018. Our live coverage lets you follow all the key moments as they happen. Head-to-head: see historical stats and visit our detailed profiles for Roger Federer vs Kevin Anderson. Get all the latest on Tennis: fixtures, results and tables. So there we go - join me elsewhere for the rest of Del Potro-Nadal and Raonic-Isner. Wow! Anderson barely even celebrates. Maybe he's knackered, maybe he just thinks it's about time. He meets Raonic or Isner in the semi, but forget that for a second - this was so, so special, the match of his life. He attacked the great Roger Federer who was in an impregnable position, pulled it off, and here he is in the Wimbledon semi! What a match that was! Phew! So here we go! Can Anderson hold his nerve! My heart is thumping, so I don't know how he's going to manage! Maybe he isn't! A net cord, then a serve that's wide, then a tired, nervous one that Federer returns well; Anderson can only hook wide. He responds with an ace ... incredible ...then they slug it out from the baseline and Federer goes long on the forehand. This is what's killing him here - he's not been able to win the longer points - and when Anderson powers a forehand down the line, he raises two match points! I cannot believe I'm even typing that! A SERVE DOWN THE MIDDLE, AND KEVIN ANDERSON HAS BEATEN ROGER FEDERER FROM TWO SETS DOWN! YES HE HAS! A FANTASTIC, WONDROUS, GUTSY PERFORMANCE! BRILLIANT! Anderson gets to 0-15 so Federer glides a backhand winner down the line. But then it's 15-30 ... huge point. So what does Federer do? He serves wideish, then hops around his backhand to power a winner down the line. Course he does. AND THEN FEDERER SERVES A DOUBLE! HIS FIRST OF THE MATCH, HIS FOURTH OF THE TOURNAMENT! BREAK POINT! AND AFTER AN OK RETURN, FEDERER NETS ANOTHER FOREHAND! ANDERSON IS GOING TO SERVE FOR THE MATCH! The elusive break just doesn't look like coming at the moment. Anderson holds to love, finishing things with a clean-up forehand. I don't know, I really don;t - this is barely tense at the moment, they're serving so well. Anderson is still pushing, and a forehand error gives him 15-all. But, though he's in points thereafter, he still loses them all and must now serve once more to stay in the match. Love hold for Federer, who's been under hardly any pressure on his serve in this set. But all it takes is a couple of good returns and everything changes. Anderson opens with an ace and a service winner, eventually holding to 15. That was smart, and I've still no idea who's winning this, never mind when they'll win it. "I need to watch the football!" shouts an hilarious wag as Federer starts the game well before, at 40-30, Anderson shows incredible speed and anticipation to run down a drop, only just missing the line with his response. Anderson holds to 15 but there were chances for Federer there - he just couldn't hit his straps. We go again. Federer hasn't served one double this whole match and only three in the tournament, then at 15-all he plays a perfect point then advances and dumps a smash into the net! So he dredges up a great serve, then when Anderson hits a net cord next point, he has the presence of mind to adjust his approach and hit a drop, then clear up. What a man! He then finishes the game with another overhead before pouting and smouldering in his seat. He liked that. Federer is coming. At 15-all he plays a forehand into the corner, then as Anderson comes back, another forehand fills in the gap. But Anderson swipes through a fantastic forehand winner, then slings an ace down the middle and a service winner out wide! What can you do?! Federer is playing better now, and rushes through another love game. Check to you, Kev-o. And there it is! A perfect return, cross-court, gets Federer ahead, then a beautifully put-together point allows him to finish at the net with a drop. But look at Kevin Anderson! A high-kicking second serve sees a backhand dumped into the net and in the next rally a slip is followed by a Federer forehand into the net. A brilliant forehand winner - out of nowhere - follows, but then another forehand wafts wide ad we have deuce. So Anderson finds an ace out wide - usually he goes down the middle - and wins the next point too! I have no idea how this is going to pan out. The holds are coming pretty quickly now, and Federer's forehand looks a bit better than before. If he can get a decent return or two here, I'd not be surprised to see him put Anderson under. Anderson is still as hot as when he started playing well and he holds to love. Superb from Federer, holding to love. This is easily the best match I've seen this tournament, and who knows what's to come? Anderson is serving so well - though I reiterate, that isn't why we are where we are. He quickly reaches 40-0 ... but then it's 40-30, and suddenly Federer glides a slice cross-court and Anderson can't respond ... in the moment. What does he have now? A first serve, but not enough otherwise! He sends a slice long, and here comes Federer! Anderson's first serve is good enough to save the break and then in a long rally his willingness to go for things allows him to dictate and make advantage - Federer is back to the Federer of three years ago, taking no risks. He does outlast Anderson to get back to deuce, but loses the next two points conclusively and the pressure is back on him. Have a look! Anderson is knocking seven shades out of the ball and gets to 0-30! Federer responds with a serve that can't be returned, then another which is sent back long. This is terrific, nervy stuff, but Federer is fine, another big serve down the middle, then one out wide, and he's back sitting down. This is fantastic. Four huge serves, one after the other! Anderson has the chance to win the first point of the game but doesn't find a winner and Federer capitalises; is he getting tight? Perhaps so! A forehand then goes wide ... but an ace redeems it. and consecutive big forehands make it 30-all. Another forehand, and then an ace, and what a hold that is! A love hold for Federer, who's looked a bit better these last few minutes. What's unusual about all this is that Federer hasn't really adjusted in the time Anderson's been playing well. And don't be thinking this is just about the serve - Anderson's taken the upper hand in lots of the rallies and it's been Federer looking to make them shorter. He holds. At 0-15, Federer nets a volley! So down comes an ace, wide to the forehand, the another fine serve out to the backhand - he cleans up easily. A service winner down the middle comes next, then a return goes out, and is Federer back? At 15-all Anderson sends down another ace, his 19th, and looks really confident. Federer does not look like breaking at the moment. Anderson begins the set by attacking, whipping returns as soon as he can get hold of the ball. It doesn't work for him here, but it does rush Federer who holds to 15 nonetheless. How're your nerves, Kevin? Well, Federer brushes a forehand onto the baseline for 0-15 but can't get his next return over the net. There follows an ace, all 132mph of it, but a lovely cross-court return facilitates the simply put-away on the volley; 30-all. Still, Anderson is at it and a serve out wide is so good that it allows him to clean up even though Federer returns well; set point! Federer, though, is not going away, and a forehand down the line earns him deuce, then a backhand pass gives him a chance to break back ... only for Anderson to swipe an almighty backhand winner. An ace follows, then another winner - this time on the forehand - AND WHAT IS GOING ON? KEVIN ANDERSON IS GOING ON! Consecutive aces from Federer to open the game, then a netted return, then a run around forehand down the line. He has one chance to rescue the set, else he's in a shoot-out with a server - not somewhere anyone wants to be. Anderson has really played on Federer's forehand but doesn\t have to here, a love game featuring three aces piling the pressure onto the greatest. Federer just isn't putting it together here, getting to 0-15 before being pegged back. he has chances in the next few points too, can't convert them, and Anderson must be smelling a breaker at the very least. This is brilliant from him! Look at this from Kevin Anderson, wrapping his racket around a topspinning cross-courter for 30-all. But Federer responds with an ace ... and looks primed to win the next rally only for Anderson to unveil a delicious slice winner down the line, table-tennis style! Federer takes the next two points for the game, but he's under pressure here. Anderson holds to 15, and he's doing really well here. Many others would've shrunk after the first set but he started to go for things and is reaping the rewards. A lesson for life right there. Federer powers through a hold. He'll have to play much better than this if he's to beat whoever's next - assuming Super Kev doesn't deal with him here and now. A hold apiece, Anderson's to love. He's enjoying himself here and Federer is starting to look nauseated. Magical stuff from Federer, who springs into life and plays two brilliant points for 0-30. A point each and it's 15-40, then Anderson cracks an gigantic inside-out forehand winner; one break point remaining. And it's saved when Federer first misses the chance to hit a winner, then nets! And he dominates the next rally too, only to swipe wide, and there's an ace down the middle! The comeback is on! Oh dear. Anderson earns himself break point, does brilliantly as Federer sends him scurrying to hither and yon, then overclumps when given a chance to hit a winner! But it doesn't matter! A Federer second serve is short, so Anderson administers the treatment, cracking a backhand pass down the line. He was passive in the first set but has been much more aggressive and consequently much improved thereafter. Magical from Federer at 40-30, taking a huge step to guide a backhand pass down the line and from there racking up match point. But Anderson finds a first serve and a backhand off the frame brings him respite, however brief. Oh, well done Kevin Anderson; he holds, and lives another rotation. Federer holds to 30, and Anderson must now serve to stay in the match. Good luck, mate. From 30-0 Federer makes 30-all, some aggressive hitting, moving in, helping with the second of those points. But Anderson manages to hang on, though the feeling persists that Federer will raise it whenever he deems that necessary. Federer holds to love, and looks about ready to break. Federer gets to 30-all but Anderson does really well to close out from there, showing a lovely touch at the net in the process. A love hold for Federer. Anderson is holding nicely these days, after Federer gave him hell in set 1. 2011 was the last time Federer lost a game from two sets up, in the quarter here against Tsonga. He holds to love, and opens a new racket while glugging what looks like filthy dishwater. Anderson wins the first point of the set with a brilliant backhand winner down the line, for all the good it does him; Federer holds easily. Immediately, Federer takes his own mini-break and stretches to 5-2; Anderson must hold his next two serves but can manage only one, a lovely inside-out forehand giving him three set points. He looks ready to take the first, opening the court with a big serve, only to then go long with a forehand ... and again! But what a forehand does Federer produce when Anderson serves, hard, top-spun harder, and whooshing into the corner thereby forcing the error. That's 44 sets in a row for him; not bad. Anderson kicks-off with an ace down the T and then uncorks a banging return, dictating the rally before Federer nets; the mini-break is his. But not for long, two glorious sliced backhands snatching it back a-sap. Check out Kevin Anderson! He dominates the first point of the game, finishing it with an ace, then puts plenty on a forehand return to dictate the next rally ... eventually Federer nets! 0-30! A service winner follows, then a netted return, two more big serves, and a breaker it shall be! From 40-0 Federer gets to 40-30, but puts just too much on a forehand and must now serve to stay in the set, whole Anderson is assured of a breaker. Anderson's return speed is well up on what it was and he wins the first point of this service game only for Federer to claw it back with a fine second serve. He closes out from there easily enough. Another love hold for Anderson, who's looking pretty confident on serve now. Federer will now try to stay in the set. Federer thinks he's held to love, letting a forehand go, only for it drop over his shoulder and in. So he wins the next point instead. We see a graphic that shows us how much closer to the baseline Federer stands than Nadal, giving the server less time to react to his return, which comes at him quicker. Anyway, again Federer has to face a break point .. and this time he saves it, even yelping in triumph. Two first serves later, the set is level. Time's up. Federer starts playing and at 15-30 he chases to the backhand side and as he slips, guides a lob over the 8"9 Anderson and in! That is frankly obscene. But Anderson saves both break points ... then loses his break on the first deuce. He's doing his best to pretend to the contrary, but let's be real: he knows. At last, the fightback begins. Federer holds to love, somehow. A love-hold for Anderson! He's rinsing it! Anderson finds a couple of returns to get 0-30, and after Federer closes, another, down the middle to the ankles, gives him two break points! And look at that! His next return loops off the line so is only poked back, and there he is to despatch a winner! 85 and out for Federer! Anderson disappears, as you might, and is then praised for his body-language, which tells you all you need to know. Again, he finds himself at deuce, but two aces get him sat down again. Anderson has been on court four hours longer than Federer this Wimbledon, and this set is over in 26 minutes. He is just so stupidly good, cementing things to love and finishing with a forehand drop. Boris says he's "very unique" and perhaps in his regard that tautology is permissible. Anderson nets a forehand to give Federer break point and after a fault a forehand return cramps Anderson, who wafts a backhand slice over the baseline. That's the double-break, and Federer will shortly serve for the set. Yeah, a love hold, yeah. Federer forces Anderson to play three deuces before a forehand return goes wide. A big serve and clean-up forehand follow, but Anderson is being forced to fight for everything; my guess is we gets two sets with one break, then a third that's not at all close. Federer hasn't been broken at Wimbledon since losing his first service game of last year's semi to Berdych; I'm not sure Kevin is the man to sort that, though the record of 118 straight holds belongs to Pete Sampras, 118 between from round 3 in 2000 and to round 2 in 2001. He holds. Federer gives away so few free points, but Anderson is finding his first serves now and holds to 15. An ace for Federer to begin with, who holds to love and in making it 40-0 finds a particularly delicious angle across the net. He's quite good. Immediately, Federer races to 0-40, and Anderson looks peaky. But he slams a phat service winner down the middle next, only to lose the point as soon as the tennis starts. Federer seems deeply affected by the No.1 Court slight. "Morning Champ. How do you fancy No.1 Court for your semi?" Such is the star-power of Kevin Anderson. Basically, Federer never loses to people who just serve, so expect this one to be over in short order.